Hi I am looking for Bugg puppy. Do you have any available? Hi I am looking for a Bugg puppy. Do you have any? Just curious if you had any Bugg puppies for sale. I am local and I would love to meet with you and see the litter if possible. Thanks. Do you have any bugg puppies available? I was wondering if you have any Bugg puppies available, or if you plan on having any available in the near future? Thank you! Hello i am looking for a bugg puppy do you have any available? Thank you. Hi, do you currently have any bugg puppies available? Hello, we are looking for a Buggs puppy. We currently have a 13 yr old Buggs and are ready to have a puppy. What do you have or can you point me in the direction of someone close by. Thank you, Rhona. Hello , we are looking foe a male bugg. We currently have an 11yr old Bugg and we are seeking a male pup. If so would love to have one. If not could you point me in the direction of one. Hello I am looking for a male Bugg. If so could you tell me the cost if not point me in the direction of one. Hello! We are looking for a bugg puppy. Do you have any available? Please email me thank you! 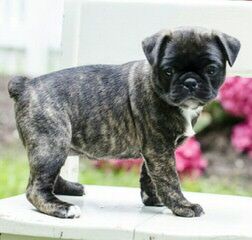 We are like looking for a bugg puppy, either black or brindle. Do you have any available?